With the presidential election coming closer and closer, one topic on this librarian's mind is presidential picture books. 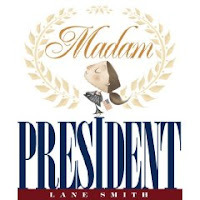 So I'm happy to point out that Lane Smith has a great, very timely, new picture book out: Madam President. A little girl, freckles all across her nose, hair pulled back in a no-nonsense ponytail, imagines what it would be like to be president. Giving executive orders ("More waffles, please. "), kissing babies, negotiating treaties (between a feuding dog and cat), and much more. Smith's signature illustrations are hilarious. I love that everywhere she goes, Madam President hands out tiny American flags. She's appointed her cabinet, including Secretary of State, Secretary of Defense, Secretary of Pizza, and Secretary of Secretaries. Every time I look through this book, I find new details that make me love it even more. I was laughing the whole way through. And speaking of books that make me laugh, I've also had the pleasure of reading Bob Shea's new book (also illustrated by Lane Smith): Big Plans. As a little boy sits in the corner of his classroom, he warns that "soon the entire world will know of my big plans". Because although he might be in a spot of trouble at the moment, this boy has BIG PLANS. BIG PLANS, I SAY! What are the big plans, you ask? Dressing for success and taking over a major corporation. Dropping in on the local sports team and saving them from certain defeat. Taking over the president's job (he's only too happy to bow out after learning that this boy has BIG PLANS!). And much more. The details in the illustration add so much to the story, right from the first page where we see a chalkboard filled with sentences the boy has purportedly written as punishment. One of the sentences is "I will not scheme in class." And the fun continues from there. If you like Madam President, be sure to pick up Lane Smith's John, Paul, George, and Ben about our founding fathers. And if you like Big Plans, you'll certainly want to find Bob Shea's New Socks. More reviews of Madam President are here, here, and here. Another review of Big Plans here. I'd recommend both of these for lower elementary kids (K-2 or so) and you'll want to make sure they have the opportunity to pore over the pictures and find all the details in the illustrations.